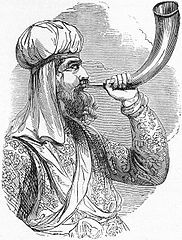 “Speak to the children of Israel, saying: ‘In the seventh month, on the first day of the month, you shall have a sabbath-rest, a memorial of blowing of trumpets, a holy convocation'” (Leviticus 23.24). Leviticus 23 does not say much more about the Feast of Trumpets, other than they were not to do any customary work, and they were to make a burnt offering. Numbers 9 provides more information on what the Lord wanted for this feast. This entry was posted in Leviticus, Seven and tagged Feast of Trumpets, Featured, Leviticus 23.24, seven in the Bible, sevens in the Bible, Seventh Month. Bookmark the permalink.